When my interview for Episode 94 fell through a few weeks ago, I decided to do a season-closing solo episode talking about what I’ve learned in the last two years of podcasting. It seemed fitting as I just celebrated my second podcasting anniversary on June 1st and am about to take an extended leave from the show following the birth of our second child in mid-June. In this episode, I share what God’s been teaching me over the last two years of podcasting. However, these lessons aren’t really about starting a podcast. Whatever your dream, you can apply them to your journey. I’ve broken the lessons down into simple takeaways so you can think about how you might start or proceed in following the dream God’s given you. You’ll learn why you don’t have to be perfect to move forward, how to consider the costs of your dream before you get started and why fear must not get the best of you in the process. For a long time, the only dream I had room for in my heart was marriage. I was obsessed. I tried to dull the ache with social activities, work, achievements, volunteering, media—anything to keep from feeling alone—but all of it left me empty. That’s why I’ve made it my mission to help other women step over what’s holding them back from pursuing their God-shaped dreams. Because I believe God created you for a purpose, with gifts, talents, experiences and passions unique to you. And He did it for His glory and His Kingdom. And I don’t want you to miss being part of that beautiful mission, like I almost did. 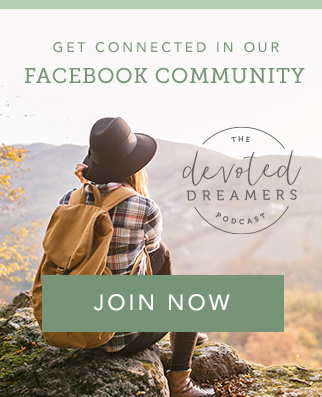 Get involved in the Devoted Dreamers Insiders Facebook Group where we talk more about these topics. 1. Be consistent in whatever way your dream requires it. 2. Step out and do something bold DESPITE the fear. 3. The cost of following this dream was higher than I expected. 4. Just because I can't or won't do it perfectly doesn't mean I shouldn't do it. 5. When I'm waking in step with the Lord in pursuit of my dream, it draws me closer to Him. 1. Listen to God; who did He make you to be? "How to Prioritize Your Kids AND Your Dream"
"How to Believe God's Sovereignty Over Your Dream"
Malcolm Gladwell, the 10,000 hour rule from his book "Outliers"